In this grab taken from video provided by ERITV, Ethiopia’s Prime Minister Abiy Ahmed, centre right, is welcomed by Erirea’s President Isaias Afwerki as he disembarks the plane, in Asmara, Eritrea, July 8, 2018. 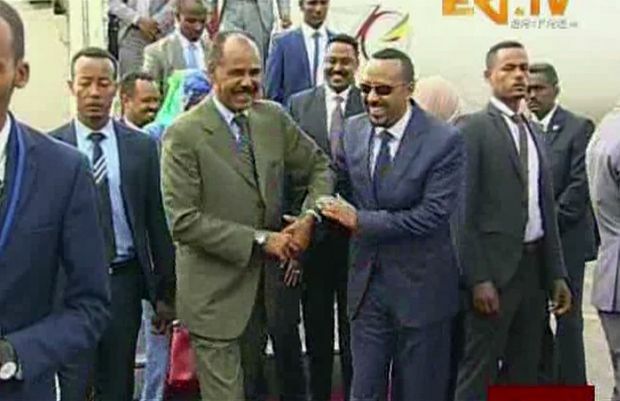 With laughter and hugs, the leaders of longtime rivals Ethiopia and Eritrea met for the first time in nearly two decades Sunday amid a rapid and dramatic diplomatic thaw aimed at ending one of Africa’s longest-running conflicts. Ethiopians could scarcely believe their eyes. After two decades of proxy wars and military tensions across a tightly sealed border, their Prime Minister was suddenly being cheered by tens of thousands of ecstatic people in the streets of their former enemy, Eritrea. The dramatic scenes on Sunday, broadcast live in both countries, were evidence of a historic rapprochement. It was the beginning of a peace summit that could bring huge benefits to the economy and security of one of Africa’s most war-ravaged regions, easing its refugee exodus and transforming the strategic map of the entire Horn of Africa. Ethiopia’s young reformist leader, Abiy Ahmed, flew into the capital of Eritrea on Sunday morning for a visit that stunned people in the two countries. While the visit had been rumoured for weeks after lower-level meetings, it still astonished those who have endured nearly 20 years of cold war and conflict. Mr. Abiy later announced that the former foes will normalize their relations, allowing visits and economic links for the first time since the 1990s. Ethiopia is the second-most populous country in Africa and an economic powerhouse, but Eritrea is one of the world’s most closed and militarized societies, often compared with North Korea. Thousands of its citizens, fleeing repression and military conscription, have made dangerous journeys across desert or water to seek haven abroad. The exodus has turned Eritrea into one of the major sources of refugees entering Europe and Israel. About 80,000 people were killed in a border war between Ethiopia and Eritrea in the late 1990s. Since then, the two countries have had no diplomatic relations, no direct flights and not even any direct telephone connections. Their feuding has hampered economic growth and triggered proxy wars across the region, including in fragile Somalia. Landlocked Ethiopia was left without access to Eritrea’s ports on the Red Sea, while Eritrea lost its biggest trading partner and remained mired in poverty and a constant state of military readiness. All of that could change now. Eritrean President Isaias Afwerki, a former guerrilla fighter who has ruled his country since its independence from Ethiopia in 1993, welcomed Mr. Abiy with a friendly hug at the airport on Sunday. Photos showed them sharing jokes and laughter in their first meetings. In their motorcade through the streets of the capital, Asmara, the two leaders were hailed by huge crowds of dancing and singing supporters. The flags of both countries were fluttering in the streets. Mr. Abiy, in a speech to an official dinner on Sunday night, said the two countries will reopen their embassies, allow visits and clear the way for direct flights and telephone calls, while Ethiopia will gain access to Eritrea’s strategically important Red Sea ports. The 41-year-old Ethiopian Prime Minister, who took office in April, has introduced a series of far-reaching reforms that have transformed Ethiopia’s authoritarian regime in the past three months. He has ended the country’s state of emergency, freed thousands of prisoners, released jailed journalists, unblocked hundreds of websites, allowed opposition groups to work freely, promised to liberalize the economy, and declared that he would honour the terms of the long-neglected peace agreement that had ended the 1998-2000 war with Eritrea. Mr. Abiy’s chief of staff, Fitsum Arega, said the Ethiopian delegation was greeted with “overwhelming joy and love” by the people of Eritrea. “The yearning for peace was palpable and we’ll decidedly move forward for the good of our people,” he tweeted on Sunday. But there are still risks that could damage the peace process. The powerful Tigrayan faction in Ethiopia’s ruling party, from the region bordering Eritrea, could be much-less enthusiastic about a peace agreement. There have already been sporadic protests in the Tigray region, and some analysts question whether Ethiopia will proceed with its promised withdrawal from the disputed border region.